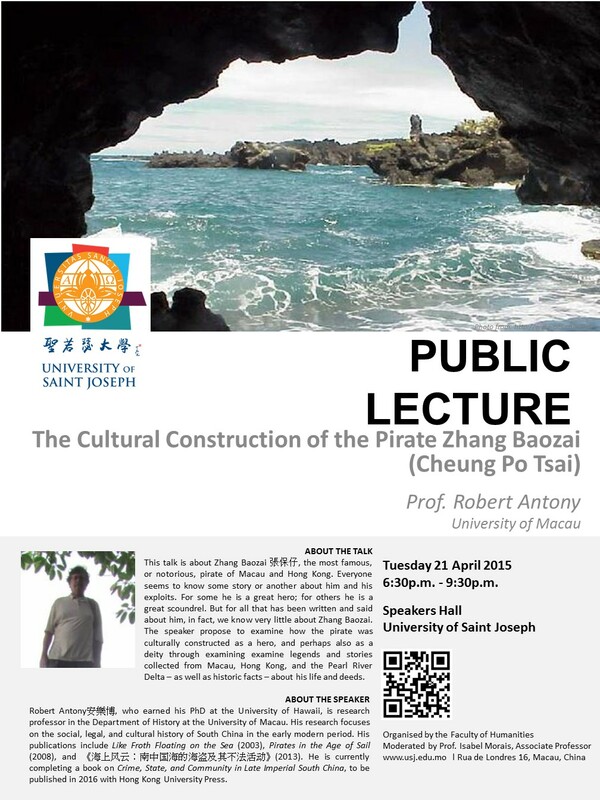 This talk is about Zhang Baozai 張保仔, the most famous, or notorious, pirate of Macau and Hong Kong. Everyone seems to know some story or another about him and his exploits. This talk is about Zhang Baozai 張保仔, the most famous, or notorious, pirate of Macau and Hong Kong. Everyone seems to know some story or another about him and his exploits. For some he is a great hero; for others he is a great scoundrel. But for all that has been written and said about him, in fact, we know very little about Zhang Baozai. The speaker propose to examine how the pirate was culturally constructed as a hero, and perhaps also as a deity through examining examine legends and stories collected from Macau, Hong Kong, and the Pearl River Delta – as well as historic facts – about his life and deeds. Robert Antony安樂博, who earned his PhD at the University of Hawaii, is research professor in the Department of History at the University of Macau. His research focuses on the social, legal, and cultural history of South China in the early modern period. His publications include Like Froth Floating on the Sea (2003), Pirates in the Age of Sail (2008), and 《海上风云：南中国海的海盗及其不法活动》(2013). He is currently completing a book on Crime, State, and Community in Late Imperial South China, to be published in 2016 with Hong Kong University Press.